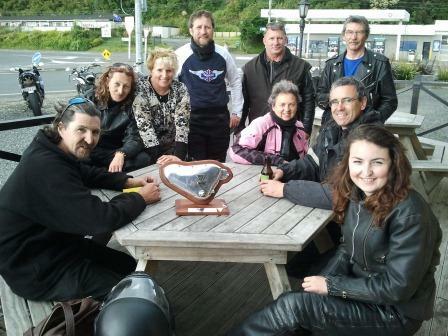 November, 2012 | Triumph Owners Motor Cycle Club NZ Inc. It was great to see a good line up of bikes turn out for this year’s remembrance ride. The change of date from December seemed to have made a difference so I think we will keep this run for the first weekend of November each year. 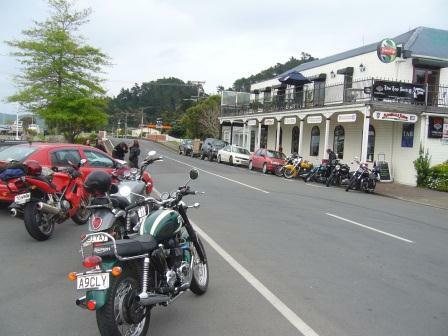 14 bikes turned up at 10:00am to the meeting place the Waikino Hotel. 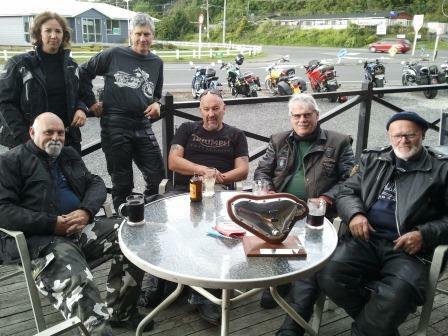 Dave on his Speedmaster, Chaz on his T00, Rob & Selina on the Rocket, Andrew D on his Rocket, Tony from Tauranga on his Rocket, Grant and Rose on their T100, Bryan and Sue on the Sprint, Trev on the Harley, Frank on the Thunderbird, Peter on his 51 Thunderbird, Shadz on his 72 (?) Bonnie, Jocelyn on the Thunderbird, Tracy on her T100 and Ray & Maxine on the Ducati. 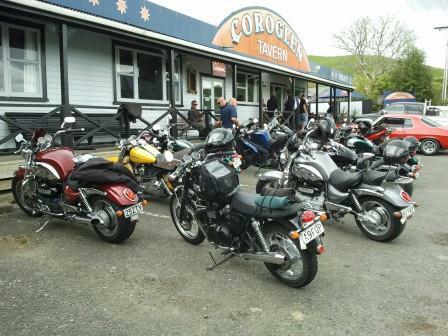 After a round of introductions we left Waikino and rode to Waihi, gassed up and headed for the Coroglen Hotel as our first stop. Peter on the Pre Unit Thunderbird and local real estate advisor lead the way with Shadz on the 650 following close behind. Unfortunately heading through Whangamata the 650 Bonnie started to miss pretty badly so the bike was left at a service station and he jumped on the Thunderbird with Jocelyn. When we arrived at Coroglen we decided to have lunch there and watch the multiple classic cars, hot rods and very nicely maintained vehicles drive past. With rain looming we were off to Coromandel. Shadz, Jocelyn & Tracy returned via Whangamata to see if they could rescue the 650. Pete setting the pace again through the hills as it started to drizzle, not enough to put the weather gear on though! (well for some anyway). Over the hills into Coromandel town and the sun was shining the sky was blue, yip just as we planned it. Another rest stop at the local Hotel and whilst inside down it came, heavy rain black clouds everywhere, just amazing and where did it all come from. Sometime latter Frank made the 5 minute call to gear up as he saw some blue that was in our direction of travel. Kopu was the next stop and once again Pete set the pace heading down the Thames coast, this bit of road is always a good ride. More toasted sandwiches at Kopu and the last group catch up as each took their own direction home. We had a good charge home heading back out past Tahuna and Orini but maybe I should purchase a new speedo cable as when out setting the pace we passed two separate highway patrol cars. I now know 5000rpm is 130kmp but the group survived as the patrolmen ignored us in our journey home. Thanks Dave for taking some photos, much appreciated and Pete for being the pace setter through the hill. Special thanks to all who turned out I appreciate the effort you all made, it was really good to have such a large group for this Remembrance Ride. We will run the same weekend in 2013, that’s the 2nd Nov. I will put it on the runs list.